When I first started blogging, I spent a lot of time staring at a blank computer screen wondering what to write about, and when a topic did come to mind, it was usually something completely random that didn’t marry up to any sort of content strategy. I just sort of winged the whole thing, and while I kind of liked the creative freedom this willy-nilly approach offered me, I soon realized it was holding me back from my ultimate goal of turning my hobby into a full-time business. I needed to get serious. It was time to create an editorial calendar so I could proactively plan out my posts to ensure I wasn’t missing out on seasonal opportunities and wasting precious writing time trying to brainstorm ideas on the fly. Of course, this all sounded exciting and sophisticated, but when push came to shove and I tried add some sort of balance and order to my blog, I felt totally lost. I had no idea how to plan out my content, and each time I sat down to create a spreadsheet to keep track of all the ideas floating around in my brain, I became too overwhelmed to focus. I just didn’t know where to start. But my mom didn’t raise quitters, and over the last 3+ years, I’ve tested many different templates and approaches, and I’ve finally landed on an editorial calendar that works for me and my business. I’ve also come up with an effective strategy that helps me plan out my blog content in advance so I can stay on top of trending topics and seasonal opportunities, which in turn allows me to focus on the things that contribute to my bottom line. And today I’m going to share all of this with you. I’m going to teach you how create an editorial calendar that works (and share the exact template I use), how to develop a proper content strategy, and how I plan out 3+ worth of blog post ideas in less than a day. Simply put, an editorial calendar provides a holistic view of the content you intend to publish on your blog over a period of time by allowing you to proactively schedule a series of topics and themes aligned with key dates. It allows you to map out the 5 Ws of your business: the What, Who, When, Where, and Why of everything you publish. In my honest opinion? Yes. While working on the fly may work effectively for some people, creating and adhering to a proper schedule will do wonders in helping you meet your blogging goals by enabling you to identify areas for opportunity you may otherwise miss. WHAT SHOULD YOUR EDITORIAL CALENDAR INCLUDE? Every business is different, but in my experience, an effective editorial calendar for bloggers should include: key dates, affiliate opportunities, email topics, post ideas by category, and sponsored content opportunities. And now onto the fun part! I’ve created a copy of my 2017 editorial calendar, which you can download for free HERE, and I’ve outlined the steps I take to plan out my content below. While some bloggers go so far as to plan out their content a year in advance, I do my planning on a quarterly basis so I can stay on top of new and emerging topics. I block off time in my calendar every 3 months so I can sit down and brainstorm blog post ideas, with prompts a week in advance to start gathering information to help me with content generation. The first thing I do when I start brainstorming blog post ideas is to identify key dates – holidays, seasonal trends, etc. I start writing about these topics 45- 60 days in advance to ensure I allow enough time for my posts to start showing up in search engines, in Pinterest feeds, etc., and schedule them accordingly. I also evaluate what (if any) seasonal content I’ve already published, make any necessary updates, and add those posts to my editorial calendar with the intention of republishing them on my blog when applicable. Once I’ve identified and scheduled seasonal content, I open up Google Analytics and determine which posts performed best the year prior so I can ensure they are updated and added to my editorial calendar for republishing. I then look for trends and brainstorm additional post ideas I can write about on the same topics. For example, in January 2015, I created a round up of the best Weight Watchers Dinner Recipes, which drove a lot of traffic my way, so in November 2015 I scheduled and created additional Weight Watchers round up posts, which saw similar results. When I’m due to start planning my next round of blog content, I buy a stack of magazines that are aligned with the topics I blog about, and then I head to my local coffee shop so I can analyze them for trending topics and themes. I make a list of everything that stands out and interests me, and then spend some time plugging keywords into Google to get a sense of how popular the topics are and how I can make them more relevant and interesting to my audience. Pinterest has always been one of my favorite places to brainstorm blog post ideas. I begin by typing the categories I write about into the search bar and scanning the posts that pop-up both in the drop-down menu and within my feed. Once I’ve exhausted that approach, I do the same with the keywords from all of the blog post ideas I’ve already added to my editorial calendar. It sounds tedious, but I’m always amazed at how many awesome ideas I come up with! Another great tool for coming up with blog post ideas is to go straight to the source: your audience. There are lots of great ways you can do this – by setting up a survey in SurveyMonkey, emailing your subscribers, or asking questions on your social media pages – and it’s an effective strategy for identifying the content your audience wants to read about, and brainstorming different ways you can deliver it to them. Once I’ve filled my editorial calendar with current and seasonal topics, and assigned them to each of my team members, I spend some time brainstorming paid opportunities. I only work with affiliates and sponsors that are naturally aligned with the topics I write about on my blog, and ensure to identify key dates ahead of time so I don’t miss important opportunities. Ideally, I like to incorporate my marketing initiatives into my overall strategy, but if a separate blog post is required, I make sure I pencil it in at the appropriate time. I’ve already preached the importance of building and nurturing an email list if you want to turn your blog from a part-time hobby into a full-time business, so it should come as no surprise that I put the same amount of time and effort into planning out my email content as I do my blogging content. Fortunately, the two tend to overlap quite a bit, but since email offers an opportunity to get more personal with my audience, I tend to be a bit more specific in the information I email to my subscribers. If you want to take your blog from good to great, an effective content calendar combined with a winning content strategy is key in creating a holistic plan that targets key dates and topics that will resonate with your existing audience and drive additional traffic to your blog. The trick is to plan ahead. I hope my editorial calendar template proves useful to you (you can download a copy of my 2017 Editorial Calendar for free HERE), and that I’ve provided you with the tools you need to create a content strategy that works for you and your blog. I try to keep this in mind each time I open up my editorial calendar – whether I’m brainstorming new content ideas, or checking in to see what’s on schedule for the day – and find that if I consciously put myself into the shoes of my audience and provide them with the content they want and need, I always come out on top. 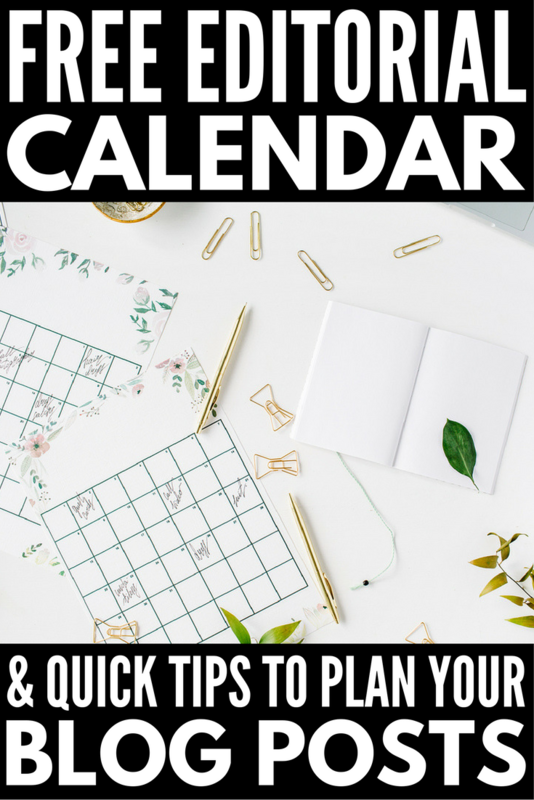 If you found this free editorial calendar template, and our step-by-step planning guide for identifying seasonal, trending blog content ideas that drive traffic helpful, please share this post on Pinterest! And if you’re looking for more blogging and social media tips and tricks, please follow our Blogging board!